It had been a while since I had made Samosas and I had a craving. Classic Indian Cooking by Julie Sahni. This is my go to book for Indian recipes. Oil for frying. 3" deep. Put the flour and salt into the container of a food processor, with the steel cutting blade attached. Process for a few seconds to mix them. Add shortening, and process, pulse, turning the machine off and on until the fat is well distributed through the flour. Add the water through the feed tube, with the motor running, until the dough forms a ball. About 15 seconds. Remove the dough from the food processor and gather it into a smooth ball. Coat the ball with a little oil and place it in a bowl. Cover with plastic wrap, and let rest for 1/2 hour. To make the filling, heat 4 Tbs. of vegetable oil in a large skillet over medium-high heat. Add the coriander seeds and fry until they turn dark brown (about 15 seconds). Add the onions and ginger, and continue cooking until soft, about 4 minutes. Add garlic. Add the diced potatoes and fry, stirring until potatoes begin to become dry and looked fried. Add peas and cook another couple of minutes. Turn off the heat, add the chile (or cayenne), garam masala, lemon juice, and salt. Mix well and set aside to cool. To assemble, knead the dough for a minute. Divide into 2 equal parts. Using your hands, roll each portion into a 1/2-inch thick rope, and cut each rope into 8 pieces (or six if you want larger samosas). Roll the small pieces into smooth balls. Cover with plastic wrap. Working one at a time, place one ball of dough on your work board, dust it lightly with flour, and roll it into a 6-inch circle. Cut the circle in half. Now you have two semicircles. Each semi-circle will make a samosa. Place a small bowl of water next to your work board. Form a cone and moisten half of the semi-circle’s straight edge with water and bring the other half of the straight edge over it, so that the dry side overlaps the moistened portion by and 1/8 to 1/4 inch. Press overlapped edges securely together to seal. Be sure to pinch closed the point of the cone as well; this will keep the stuffing in during frying. Fill the cone with one heaping tablespoons of the potato filling. Moisten the open side of the cone with water and pinch the opening closed. Continue with the rest of the dough and filling in the same way. 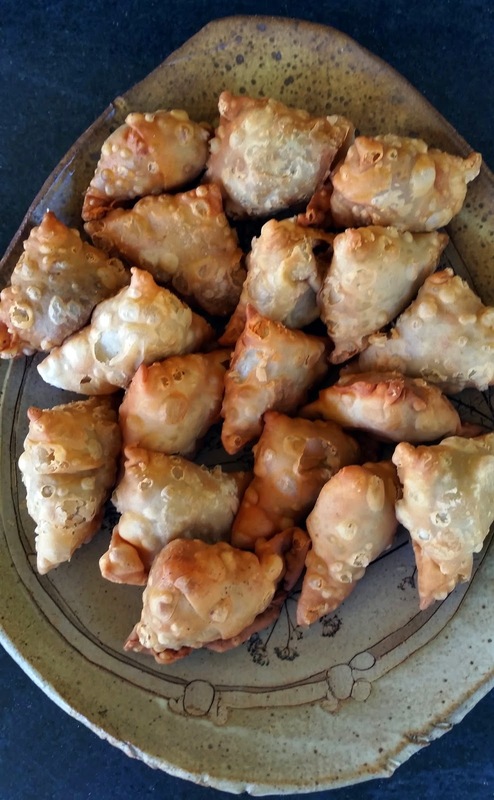 When ready to fry the samosas, heat about 3 inches of vegetable oil in a large pan to about 350° F. Add the samosas in batches , being careful not to crowd the pan. The temperature of the oil will drop slightly to 300°F. Maintain the temperature between 300°F and 325°F. This will enbale the the pastry to brown evenly and become flaky. Fry , stirring and turning the pastries until they are a light brown. About 12 minutes. Remove using tongs or slotted spoon and drain on paper towels. They are gorgeous! We have bought some..twice last year..a new Indian shop next town over..really good..but no comparison to yours!